What to do with all of those hard boiled eggs after Easter? Make this vintage recipe just like Grandma used to . . . Eggs a la Goldenrod. 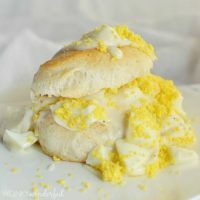 The perfect Easter Brunch Recipe! The Easter Egg Hunt is over. What next? 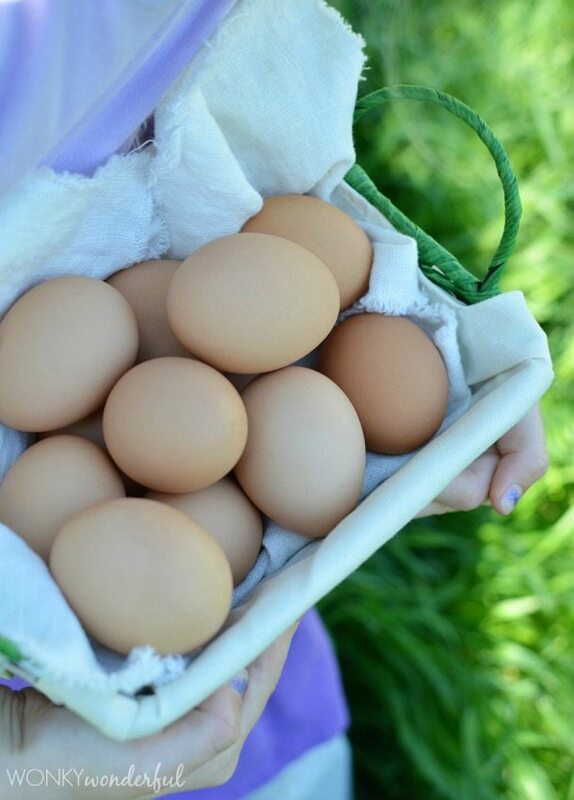 You have a dozen or more hard boiled eggs and hungry little mouths to feed. Make Eggs a la Goldenrod for your family. 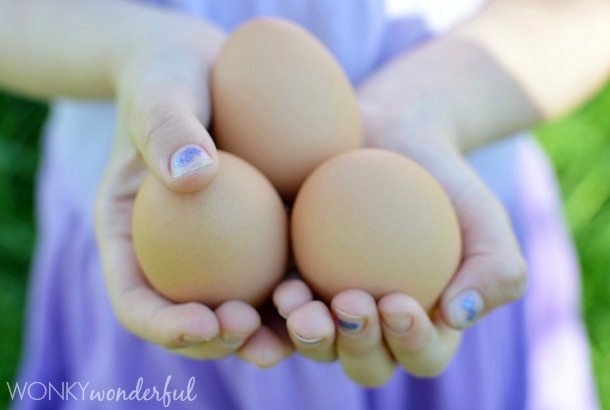 It is fun to say and an interesting way to use all of those eggs! Traditionally, Eggs a la Goldenrod is served over toast. I serve mine with Pillsbury Grands Biscuits. 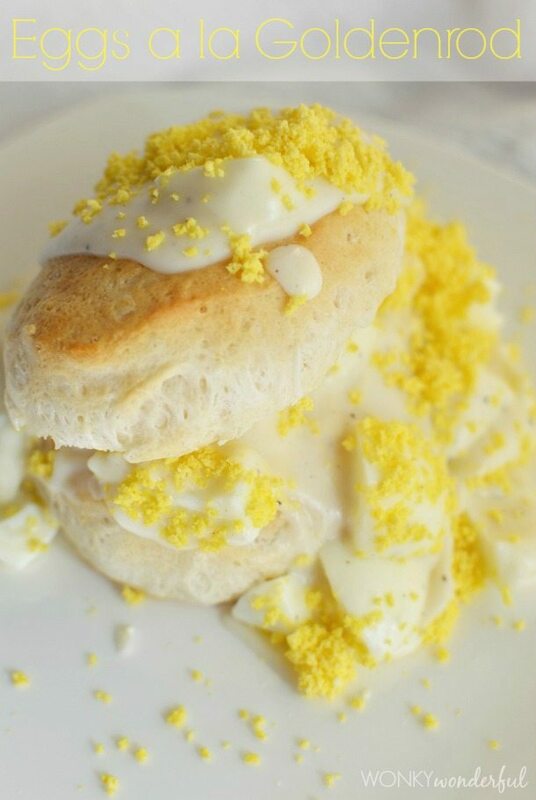 Smother the biscuits with the white gravy and sprinkle the egg yolk crumbles on top. My first experience with Eggs a la Goldenrod was back in high school. I spent Easter at a friends house and his grandmother made this dish for Easter Brunch. It tasted amazing! This was way back before I had any interest in cooking. But I enjoyed it so much that I asked for the recipe. She happily explained how to make this simple Easter Brunch Recipe. The older woman had learned to make this simple egg dish in her Home Economics class back in the 1930’s. Maybe that was when my interest in vintage recipes first began. I own several vintage cookbooks and love trying old recipes from the early 1900’s. Unfortunately at some point I developed a sensitivity to eggs. So I can only enjoy about four bites of this wonderful dish. Otherwise I would have a very painful Easter afternoon. But, I still make it for the family. My daughter ate three servings! Then requested more for lunch! She also had fun helping with these Easter Egg Hunt photos that were taken in early March. I told her it was an Egg Hunt practice run. Peel the boiled eggs and slice in half. Separate the egg whites and yolks. Chop the egg whites to your desired size. Set aside. Using the back of a spoon, push the egg yolks through a fine mesh strainer to create the 'yolk sprinkles'. Bake biscuits according to package directions or prepare toast. In a 3qt saucepan, melt butter over medium/low heat. Once melted, slowly add the flour, salt and pepper while whisking. Boil while stirring constantly for 1-2 minutes. The consistency should be a thin gravy. Remove from heat and fold in the chopped egg whites. Salt and pepper to taste. Serve egg white gravy over biscuits or toast. Top with the egg yolk sprinkles. I hope your family enjoys this Easter Brunch Recipe as much as mine does. And when you are an old granny, be sure to pass this recipe down to the younger generations. What a great idea for using up all those hard boiled eggs at Easter time!! Wow, I’ve never heard of Eggs a la Goldenrod before. I would definitely go with your choice of a biscuit. They are my absolute favorite breakfast items. What a great way to use up hard boiled eggs and I love the gravy. Oh yeah, biscuit instead of toast every time! Wow! I can’t believe I’m seeing this recipe outside my family circle! I first saw it in The American Woman’s Cook Book by Ruth Berolzheimer and tried it. I loved that book because it had many vintage and classic recipes, my daughter now has it. I use a sieve to pass the egg yolks through and you can see how appropriate the name is for the recipe. The yolks really remind you of goldenrod flowers. I’d often make it for brunch when I had many people over. My older sister would beg me to make some when she would visit but now I see that she makes if for herself! It’s that good, especially with bacon. Then again, bacon is good with everything!! Maybe this vintage recipe will make a comeback! We had this every Sunday as a child in the 60’s. We called it “the good breakfast” it was from my father’s family. Now grown, we make it every time we get together like today, which is Christmas.